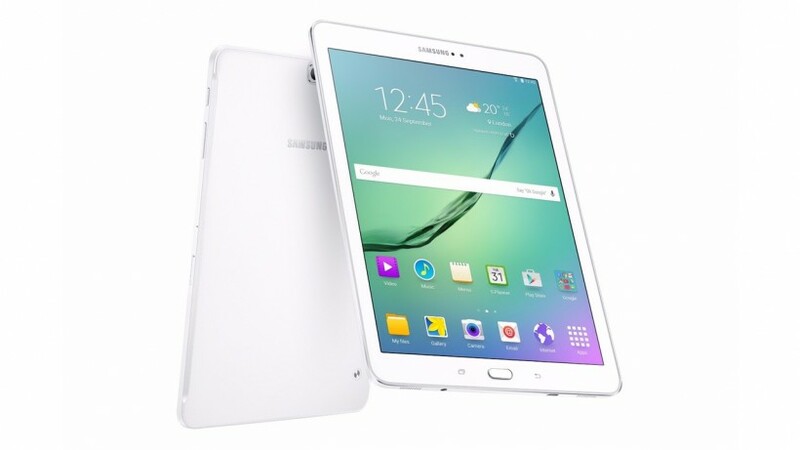 A couple years back, Samsung released the Galaxy Tab S, a tablet that offered a little more style and flair than their typical tablet offerings. Since then, style has become more part of their line and they're ready to try again with the Galaxy Tab S2. The Galaxy Tab S2 can justly be called samsung's new flagship tablets. They're stylish and packed to the gills with features. The tablets are based around a metal frame that is just 5.6mm thin, even thinner than the 6.1mm iPad Air 2 or 7.5mm iPad Mini 3. The Tab S2 also backs that up by being light, with a weight of just 392 grams for the larger model and 272 for the Mid-sized version. The styling of the device is classy, but also very Samsung. The heart is the tablets is its screen and the Tab S2 look to have a good a good one. The Tab S2 comes in two sizes, 8.0 and 9.7" at 2048 x 1536. Yes, if this does seem familiar, it's the same resolution and 4:3 aspect ratio as the current iPad line. Samsung has traditionally made its tablets in 16:9, but 4:3 is more preferred by consumers as its better for reading digital media and eBooks. Samsung admits as much and you're seeing more Android devices adopt it. It's definitely not the same panels as the iPads though; Samsung is using their own Super AMOLED technology. It features adaptive technology is make up for some of the disadvantages of AMOLED screens and there's even a dedicated reading mode. The Tab S2 features a Twin Quad-Core CPUs in its SoC in a high-low configuration at 1.9ghz and 1.3ghz speeds. That should give users power when they need it and save battery power when they don't. The CPU is paired with 3GB of memory. Storage is 32 or 64GB and unlike some of their recent smartphones can be expanded with up to 128GB of mSD storage. The cameras are good for a tablet at 8mp rear and 2.2mp front, but don't really offer anything to differentiate themselves. I/O is top of the line with Bluetooth 4.1 and 802.11AC wireless. It'll come in Wi-Fi and cellular versions with at least 8 bands of LTE for worldwide coverage. Like the GS5/6 and Note 4, the Tab S2 has Samsung's built-in fingerprint sensor. However, one apparent omission is NFC support. Software is built upon Android 5.0 Lollipop and feature's the multitasking functions you'd expect to see in a Samsung tablet. Using Android's built-in pointer support, there is a very Microsoft surface like smart keyboard coverage available as an accessory.. The Samsung Galaxy Tab S2 is TBA on price and still no word on exact market availability. The general availability date is August. This is undoubtably Samsung's best tablet yet. It borrows quite a bit from both Samsung's other tablets and the iPad, but the specs and features. look very compelling. We'll find out if it lives up to its promise in a month or so.